Seismic imaging reveals layered structures in the mantle overlying the oceanic slab sinking in the Tonga subduction zone, as shown in the two vertical cross-sections. The contoured surface of the Tonga slab is shown in gray, with earthquake hypocenters indicated in pink. Figure produced by Y. Zheng and T. Lay. The subduction zones where oceanic plates sink beneath the continents produce volcanic arcs such as those that make up the "rim of fire" around the Pacific Ocean. The volcanoes are fed by molten rock rising within a wedge of the Earth's mantle above the subducting plate. Although geologists have a pretty good picture of the processes that produce volcanic arcs, a new study finds that the structure of the mantle wedge may be far more complex than anyone had imagined. "Geology textbooks show simple cartoons of the processes happening in these mantle wedges--a sinking slab and some melting that comes up in volcanoes--but our results suggest that those cartoons are grossly inadequate," said Thorne Lay, professor of Earth and planetary sciences at the University of California, Santa Cruz. Lay is a coauthor of a paper describing the new findings published this week in the Online Early Edition of the journal Science. The first author of the paper is Yingcai Zheng, a UCSC graduate student working with Lay, and the other coauthors are Megan Flanagan of Lawrence Livermore National Laboratory and Quentin Williams, professor of Earth and planetary sciences at UCSC. 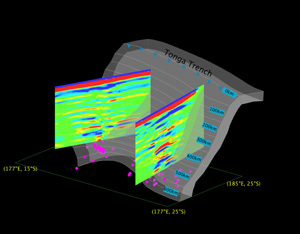 The researchers used a seismic imaging technique (reflection seismology) to detect layered structures within the mantle wedge of the Tonga subduction zone in the southwestern Pacific. Analyzing data from deep earthquakes that occurred beneath the subduction zone, they looked for seismic waves that traveled upward into the mantle wedge, reflected from the underside of layers within the mantle, and were recorded by seismic sensors in distant locations. "We were stunned to find many reflecting boundaries in the mantle wedge above the sinking slab, and these are laterally extensive throughout the wedge region," Lay said. "This is surprising because the textbook version of mantle wedges suggests that there would be little structure." The researchers attributed these unexpected features to the effects of water and other materials that are squeezed out of the subducting slab and rise up through the mantle wedge. When water is added to hot mantle rock, one of the main effects is to lower the melting temperature of the rocks. The resulting pockets of molten rock rise up through the mantle and feed volcanoes at the surface. "That all happens in the upper 100 kilometers or so and has been well understood for at least a couple of decades. But we're seeing structure much deeper down, at depths as much as 450 kilometers," Lay said. "We think the fluids don't come out all at once, but are released progressively as the pressure increases with depth and then have to percolate up through the overlying wedge." Whereas the added water causes mantle rock to melt in the upper layers, the researchers said different effects are likely to occur at greater depths. Under the intense pressures found at depth, added fluids would cause changes in the composition of the mantle rock, and structures composed of these altered minerals within the mantle wedge would be detectable by their altered seismic reflectivity. The detection of layered structures was attributed to the mantle wedge being progressively flushed with fluids expelled from the sinking slab, producing not only melts that rise in volcanoes but also mineralogical structures with seismic reflectivity. "This has many implications for how volcanic arcs evolve and how they produce the thick piles of remelted rocks that eventually add to the continents," Lay said. Zheng noted that some of the reflecting structures he detected extend far to the west, away from the trench where the subducting slab currently dives down beneath the overriding plate. "If those reflectors to the west were created in the subduction process by infiltration of fluids from the slab, they might represent the historical past of the Tonga subduction zone," Zheng said. The study used methods similar to those used in oil exploration, in which sensors record reflections of seismic waves from explosions or vibrations with shallow manmade sources at or near the surface. To study the mantle wedge, the researchers essentially turned this approach upside down, using deep earthquakes as the energy sources and looking for reflections of seismic waves traveling up through the wedge. The Tonga subduction zone is a good place to use this technique because of the frequency of deep earthquakes in this dynamic region. "An earthquake is like a flash of lightning in the dark Earth interior. We used multiple earthquakes of different mechanisms, each illuminating in a different angle, to achieve a clear three-dimensional picture of the mantle structures," Zheng said. The study was only possible, however, because of the extensive network of seismic instruments that have been installed around the world. In North America, the National Science Foundation (NSF) EarthScope project has been deploying an extensive array of modern digital seismic stations, and similar efforts around the world are linked to create a global seismic network. Seismic data from this network were obtained for the study from the Incorporated Research Institutions for Seismology (IRIS) Data Management Center. The study was funded by NSF grants and a mini-grant from the UC Institute of Geophysics and Planetary Physics and Lawrence Livermore National Laboratory. Note to reporters: You may contact Thorne Lay at thorne@pmc.ucsc.edu and Yingcai Zheng at yzheng@pmc.ucsc.edu.